While I’ve still not gotten the hang of Japanese puzzle classic Puyo Puyo, I‘m pretty good at Tetris when I concentrate. Recording a Kotaku Plays video is not a good way to concentrate, but I don’t mind losing when I get to share the colorful sights and spirited sounds of Puyo Puyo Tetris. Out this week for both the Nintendo Switch and PlayStation 4, Puyo Puyo Tetris is a combination of two of the world’s favorite drop puzzle games. Players can launch matches of either or both games directly from the opening screen, or dive into story mode, online multiplayer or splitscreen multiplayer for up to four. Watch me play through a story mission and try my hand at a little multiplayer in the video below. My performance isn’t pretty, but everything else is. Ignore my playing. Focus on the bright and welcoming graphics and the lovely arrangements of “Korobeiniki,” the Russian folk song better known as the Tetris theme. 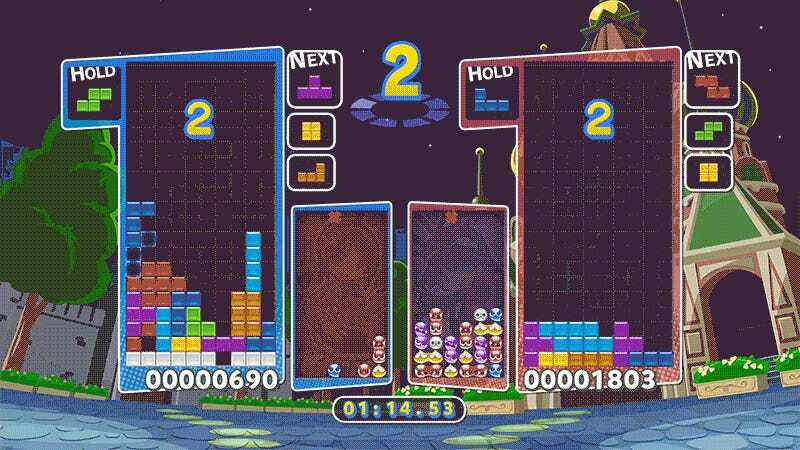 While the game’s story mode, which tells the story of two puzzle-based worlds merging into one, alternates between Puyo Puyo, Tetris and mixed battles, in multiplayer players can opt to pick their poison. When in doubt, go with what you know. Or accidentally pick Puyo Puyo and get decimated by a very good Tetris player. Puyo Puyo Tetris is a bright and welcoming game that’s as good on the TV screen as it is on the Switch tablet. You might not be a master of both games—hell, you might not be a master of either—but that’s fine. This is a lovely place to get started. Now if you’ll excuse me, I’m off to watch better people play Puyo Puyo on YouTube.